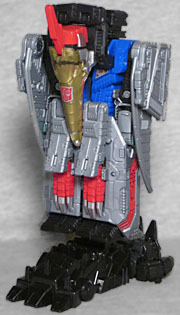 First Strafe, then Ptero, but now Swoop's got his name back! ...except his original name was Divebomb, but that got stolen from him by a Decepticon. While most of the Dinobots are angry, violent jerks (looking at you, Slug), Swoop is more happy-go-lucky and positive. Maybe it's being able to fly that mellows him out. But because he hangs out with the a-holes, nobody bothers to get to know him. Plus, there's something about his altmode that Transformers (as a species of beings) find intrinsically horrifying - kind of like elephants and mice, or cats and cucumbers. Poor guy! "Power of the Primes" Swoop is based more on the old cartoon than on the old toy, and it's comically easy to tell at a glance: the renders on the packaging show Swoop with a red chest and a clear beak, which is what the 1985 figure looked like; meanwhile, the animation stuck with the pre-Transformers "Diaclone" colors, which meant a blue chest and a gold beak. 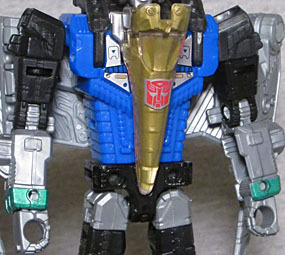 It's kind of fitting that the Dinobot whose personality doesn't mesh with the others also breaks from their usual colorscheme. He's also not as bulky as the rest of his team, with a much narrower waist - that makes sense, since he needs to be light enough to get airborne. After the colors, the fact that the face is based on the cartoon is hardly surprising. Then again, that's a common thing among modern TF toys - since more kids saw the cartoon than ever had any given action figure, the animation model is the "default" for a lot of fans. So Swoop gets two blue eyes instead of a single black visor, and it seems right. Swoop moves at the knees, thighs, hips, elbows, biceps, shoulders, and neck. He has a waist, too, but it's rendered immobile by his dino kibble. 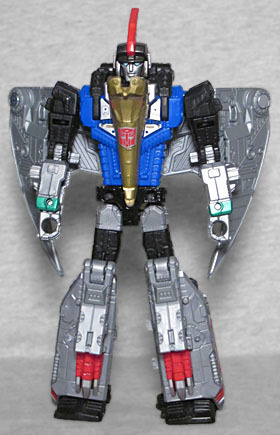 Come to think of it, with a nosecone on his chest, wings on his back, and the shape of the things over his shoulders, Swoop really looks a lot like a Seeker - does that mean if Starscream, Skywarp or Thundercracker had been awake during the Cretaceous Period, they'd have been pterosaurs, too? Maybe! 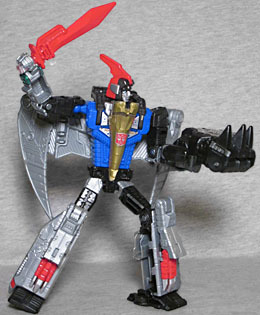 Swoop is armed with a bright red sword, and a "Power of the Primes" hand-foot-gun, which can also be attached to his chest by folding the thumbs around and clipping them into the sides of his beak. 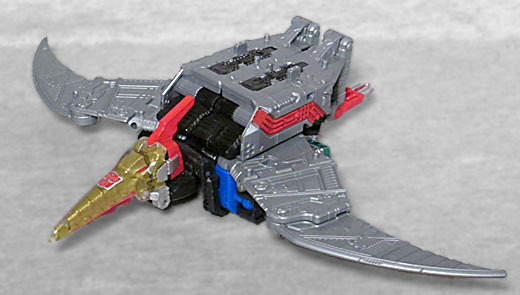 So, it's not a secret that Swoop's altmode is a pteranodon - you fold his legs up over his back, tuck his arms into his sides, and that's really all there is to changing modes. He has tiny little dinosaur feet that can either dangle behind him when he's "flying" (aka, laying on his belly) or fold forward to allow him to stand up. The wings have a pivot point in the middle, and a hinge closer to the body. 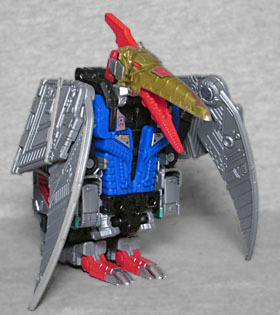 There is a flaw with the figure, though: the beast mode face raises up to cover the robot's face, but the hinge that allows this is rather floppy, meaning the big beak droops away from the head, leaving a big, noticeable gap. Usually that's the type of thing you'd fix with a drop of superglue, but there's really no way to get it onto the right parts here. Combiners are back in fashion this year, with all the Dinobots (minus Slash) joining up to form someone called Volcanicus. Any of the Deluxe Class dinos can form any limb, but the instructions say Swoop is supposed to be the right arm. But you don't care about that, you're a rebel! A loner! You can make Swoop be a left leg if you feel like it. Live your life on the edge, unconstrained by convention! Swoop is a fine figure. The loose face is annoying, but there must be some way to fix it, right? They made the right choice going with the gold-and-blue accents rather than the clear-and-red, because this is more recognizable - if they'd stuck with the old toy, everyone would be wondering why.